Thre Remoterig RRC-1258MkII system can be used in many different ways. The most important configurations are showed on the pictures below. The most common way of using the system is with radios which have detachable control panels. Whith those radios you keep the real radio feeling as the system works exactly as when you have the control panel connected direct to the radio. And the most important thing is that no PC.s are needed at all. The Remoterig are tested and supports the following rigs with detachable control panels. Note ! IC-7000 can NOT be used in this mode as the display info is sent as analog video signal. The Elecraft K3 Twin concept gives the same feeling as the control panel mode. The Elecraft K3 Twin concept is a high end concept for the serious ham who do not accept any compromise even when remote controlling his station. You can use the K3/0, K3/10 or K3/100 as control. The K3/0 is a specially design control unit. The Yaesu Twin concept gives the same feeling as the Control panel mode above as you use a second transceiver as control “panel”. This is of course a more expensive way of remote controlling but it gives you the posibility to use the best radios available on the market even for remote control. This mode supports FT-450, FT-950, FT-2000, FT-5000 and FT-9000 even in cross combinations. No PC.s are needed in this configuration either. 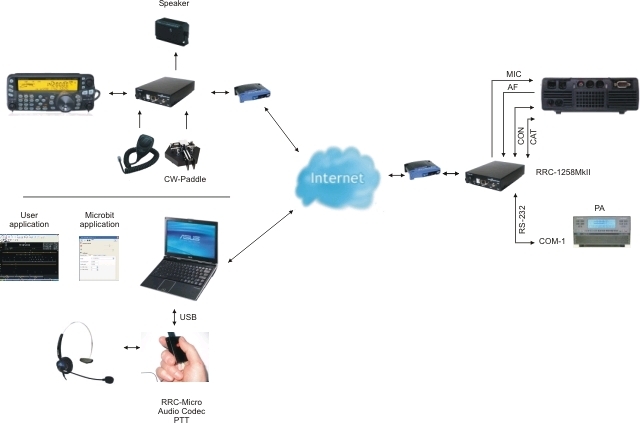 We also have a system called RRC-Micro which not need a Remoterig box in the control end, only a PC is needed with a our software client and the small USB-PTT/audio box. 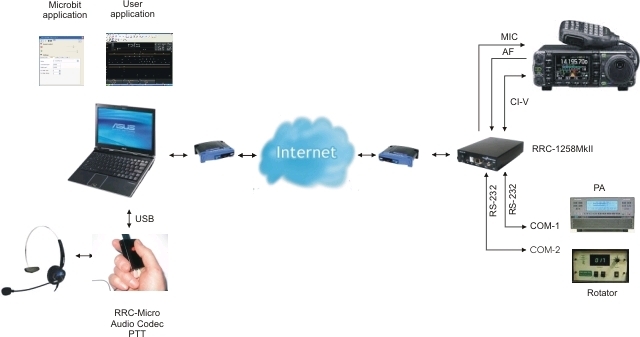 This system is very handy to use when traveling for example as you can use you laptop and connect to wireless LANs or mobile networks where ever you are. The control panel mode and the PC-control mode can be combined also so you can use the control panel when at home and the RRC-Micro PC based system when travelling.